Chinese food is one of the great comfort foods,however it could be a caloric bomb waiting to destroy your physique!!! 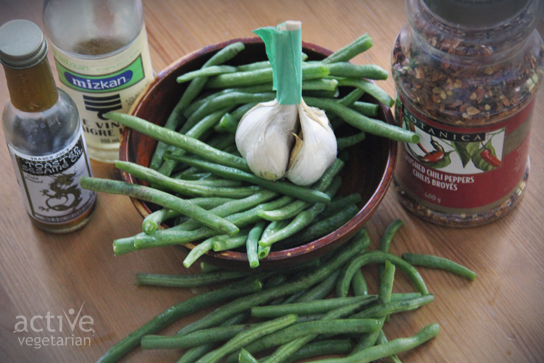 Today we are sharing a healthy spin on the typical buffet style fried green beans. 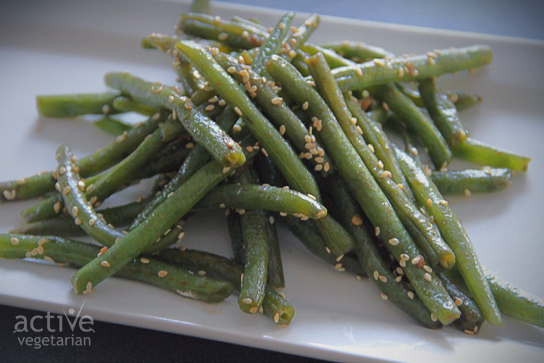 You can enjoy this delicious side dish without all the added sodium and oils. Add a cup of chickpeas and you have a healthy and hearty meal that will leave you feeling good. Cook the green beans in a pot of boiling salted water until JUST crisp-tender (about 3 minutes) plunge into an ice water bath to cool completely. Drain well and pat the beans dry using paper towels. Heat sesame oil in a wok or large skillet over high heat; add in garlic and chili flakes (if using) stir-fry 1 minute. Add in beans and stir-fry for about 2 minutes. Add in soy sauce, rice vinegar, maple syrup and black pepper; cook until the sauce reduces slightly and coats the beans (about 1-1/2-2 minutes longer). or arrowroot with a small amount of cold water and add in towards the end. Add in the almonds or sesame seeds; toss to coat and transfer to a bowl.